Miss Precious (Mom and Dad’s poodle) lived for 16 years… She will always be in our family’s memory. 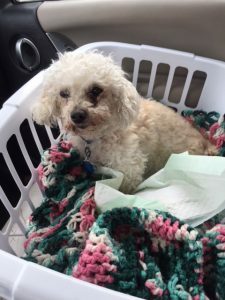 Mom and Dad were feeling something was missing in their lives and so they went “dog hunting,” and they found a playful snow white little poodle. Of course Mom said “She was “just precious.” The name “Miss Precious” stuck, and they brought her home to their place in the Eastside Village in Lake City, Florida. Miss Precious was playful, spoiled, picky and quite feminine in her doggy ways. She slept with mom and dad each night, and had to be fed at a certain time of the day. She was indeed a one owner dog, and when left alone after Mom and dad passed, she changed, her world changed. For a short time she and Molly (their cat) stayed in Mom and Dads house until Wiwik and I adopted them both into our family. “Molly,” is still with us, and sweet as ever. Both Miss Precious and Molly were “greeted” by our own dog (a Weenie dog) named Little bit. Later came “Rudy” (Bob’s dog). It just seemed that we were the ones who ended up with animals left behind. Our family changed for sure. Miss Precious was never really a “fighter.” We had to do her fighting for her, and eventually Little bit accepted her as part of the family. So from 2010 till 2018 we were blessed with this sweet little Poodle. Eventually she was afflicted with spasms like epilepsy, and with tears we had to put her down. The picture above is her last picture. Sorry about this being such a short article, but memories of her last days are just painful. I will see if Dad has something he wrote about her. I guess one must accept what comes our way when it comes to pets.